Dickey’s in Goleta will serve four weeks of specials and giveaways, including free barbecue for a year for three guests. 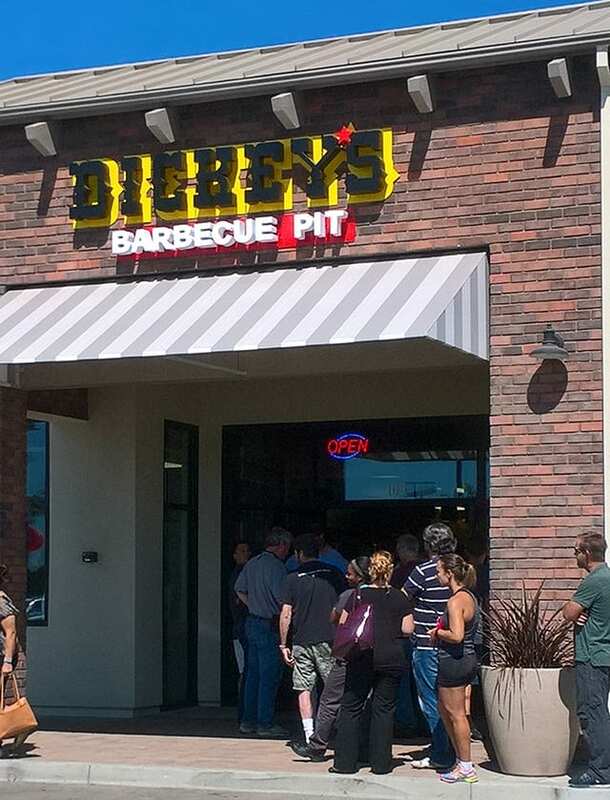 Goleta, CA (Restaurant News Release) Dickey’s Barbecue Pit opens in Santa Barbara County in the Hollister Village Plaza this Thursday with four weeks of prizes and giveaways. Three lucky guests will win free barbecue for a year, available only at the new location. To enter to win, guests can either use hashtag #1FreeYearofBBQ on any social media page, order online or sign up for the Big Yellow Cup Club to receive loyalty points and members-only specials. The new Dickey’s location will also offer a complimentary taste of its newest limited time offer, the Buffalo & Bleu Butcher Taco, to the first 50 guests in the door on Thursdays for the next four weeks. On Fridays, the new store will offer 50 percent off meals for uniformed first responders, and guests will have the opportunity to donate to Dickey’s charitable foundation, Barbecue, Boots & Badges. Thirsty Thursdays – All guests will receive a free Big Yellow Cup with Dickey’s new reusable travel lid and straw. The first 50 guests will receive a taste of Dickey’s butcher taco of the month, the Buffalo Bleu. Philanthropy Fridays – “You Give, We Give”, guests who donate to Dickey’s charitable foundation, Barbecue, Boots & Badges, will receive a gift card. Uniformed first responders also receive 50 percent off their meal. Singer/Songwriter Saturdays – Enjoy live music from a local musician. Born and raised in California, Chhina has been in the restaurant business for seven years. After making a career out of building successful businesses, he decided that he was ready to open his own franchise. He chose Dickey’s because he wanted to bring the people of Goleta real Texas barbecue. “I am excited to not only to be a part of the Dickey’s Barbecue Pit family but also engage with my local community,” says Chhina. Residents of Santa Barbara County can find their newest Dickey’s at 7000 Hollister Ave. Goleta, CA 93117. The phone number is 805-201-0444. Find Dickey’s on Facebook, Instagram and Twitter.